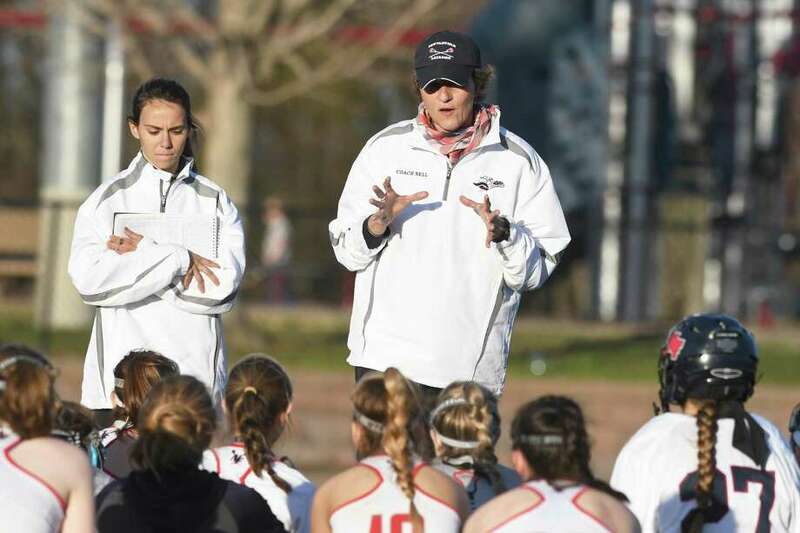 New Fairfield head coach Karen Nell, standing, right, during halftime of the New Fairfield versus Joel Barlow SWC girls lacrosse game in New Fairfield, April 26, 2018. NEW FAIRFIELD — Sooner or later, “Welcome to Lacrosse Town” will have to be put under the “Welcome to New Fairfield” signs that dot its borders. For such a small town, New Fairfield is in the middle of a lacrosse surge. Athletes on boys and girls teams are heading to the college ranks in droves, and it’s translating onto the field with all the hardware coming home recently. The Rebels’ girls team is coming off a spring in which it swept the Class S and SWC championships, and many faces return. Earning a first conference title since 2005 along with their second state title in a row, the Rebels hope to keep the winning going as they return all but two starters. A strong youth setup in town has led to the development of a host of boys and girls who will be playing in college in the next several seasons. Katelyn Sousa (Furman), Sydney Colesworthy (Sacred Heart) and Katelyn Nieves (Iona) are just three standouts who will aid the Rebels’ cause this year. Sophomore Reagan Tenaglia is a present and future star in the midfield; she’s coming off an ACL tear and spent time in the faceoff circle as a freshman. Eileen Rattigan will lead the defense and Daria Bock and Danielle Hernandez are also key pieces. In goal Rachel Mikolay is a two-time All-State selection and is heading to Elon. Seven freshmen join the program this year and some might see playing time this term. Dangerous opposition looms in perennial conference contenders Newtown, Pomperaug and Barlow; the Rebels defeated the last two to win the league tournament after losing to all three during the regular season. The season-ender offers the most intrigue as FCIAC squad Staples pays a visit May 14. That’ll likely be the lone time this season the Rebels can prove they belong in the conversation as one of the best teams in the state.